Overall, Chica and I were surprised by the number of animals we saw during our 6-months on the Appalachian Trail. Maybe it’s because we hiked as a couple and were not very stealthy, but we just didn’t see that many, especially mammals. Four bears, two moose, a few rabbits, a dozen deer, one raccoon and a whole bunch of squirrels—that’s it. The same cannot be said of snakes on the Appalachian Trail. We saw an amazing 37 snakes over the course of 179 days and 2,189 miles. Not that we polled everyone we saw, but it seemed our reptile sightings were much higher than others’. We didn’t get a photo or video of all 37 snakes, but we did of quite a few. I will post them below along with a description and snake identity. 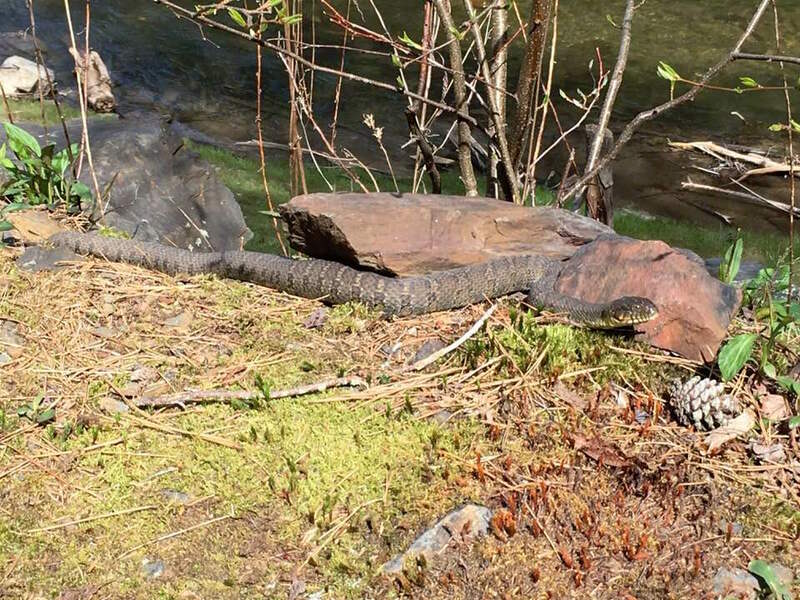 There are two photos that are not ours (copperhead and brown water snake), but they are snakes that are common enough on the AT to include. 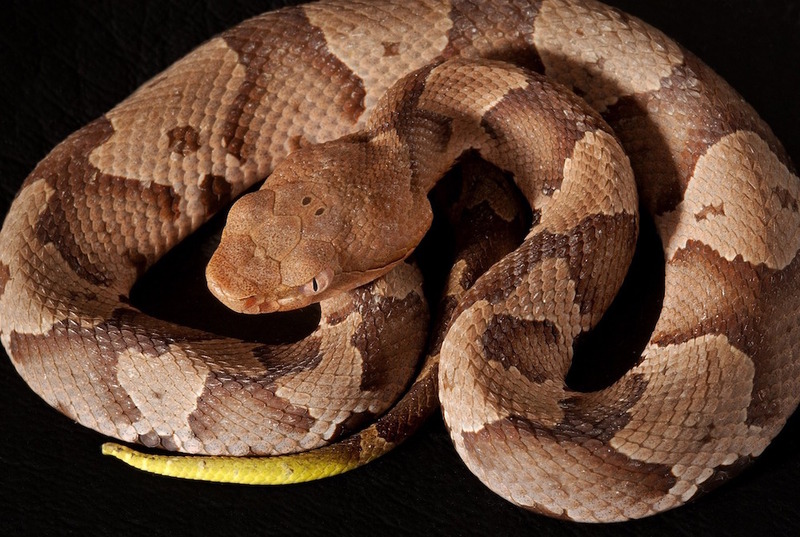 There are only three venomous snakes that reside along the AT—the timber rattlesnake, the copperhead, and the cottonmouth water moccasin. Almost all snakes just want to be left alone and venomous snakes would prefer to reserve their venom for prey. Therefore, snake bites are extremely rare and typically only happen when a snake is stepped on (or reached for on a rock scramble) or messed with by some idiot wanting a cool selfie or channeling their inner Steve Irwin. It is very unlikely that you will encounter a cottonmouth. While they exist in states that encompass the trail, their range along the AT is only the very most southern part of the trail in Georgia. As their name implies, they like water specifically swamplands and river floodplains. Neither of which are common in the early Georgia section. That short but exhilarating conversation happened in Virginia’s Jefferson National Forest. The snake Chica stepped over was a juvenile, only 14 inches long and not a single rattle had yet grown on its tail. But that head, with its triangular shape and chipmunk cheeks, there was no mistaking what this snake was. 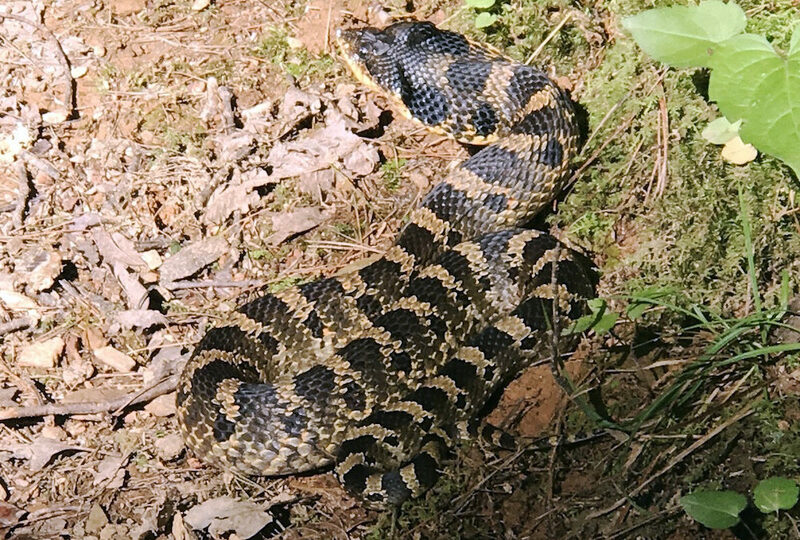 This rattler would be the first of a whopping 12 timber rattlesnakes we would see on our thru-hike. The reptile’s demeanor was mellow, even as it was bounded over. Things might have turned out a bit differently if Chica would have stepped on, instead of over, the stick-looking creature. But she didn’t. All of the rattlesnakes we saw, except two, were mellow, they did not coil or rattle or otherwise exhibit a defensive posture. The scariest encounter with a rattler was in Pennsylvania. This one was not mellow at all, it made its presence known with the tell tale (or is it tell tail) maraca shake. We had stopped to get some water. The spring source was up a short rock scramble and while I fetched water to filter Jen sat her pack down against a large boulder. We filtered and drank, idling several feet from where her pack lay. When we were done, Chica went to pick up her backpack and immediately stopped at the sound of swarming bees. She stepped toward the snake before realizing where the sound was coming from. In gathering the water, I had walked right by the snake, never seeing it. Maybe it was under a rock and it came out to check me out. Regardless, Chica grabbing her pack set him off. I was far enough away to get a quick video (see above). Chica’s hiking poles were close to the snake, but I was able to retrieve them, and we made an uneventful exit. After leaving we wondered if we should have tried leave a note warning other hikers, but this thought only occurred several miles past the water source as we were in a shock daze from our encounter. We did mention it to several southbound hikers that past us. Rattlesnakes are large and can be up to six feet in length. They like hiding in rocks and in tall grass. Three of the 12 we saw were laying in tall grass that paralleled the trail, just a foot or so from where people were hiking. Another four were stretched out across the trail in a sunny spot. Like all snakes timber rattlers are cold blooded and need sun to help maintain body temperature and digest food. We did not see any copperhead snakes on our thru-hike. It’s strange, we ran into multiple hikers who saw only copperheads and no rattlesnakes. The copperhead exists along the trail., mainly from Georgia to New York. They ambush their prey and are masters at camouflage as their pattern and coloring match fallen leaves, and they grow to between 2 to 3 feet in length. There are many varieties of non-venomous snakes you may come across while hiking in any of the 14 states alongth the trail. We saw our first snake in North Carolina and our last snake in New Hampshire. We did not see snakes in Georgia, Tennessee, West Virginia, New Jersey, or Vermont. So, in 8 out of 14 states we came across a snake or two. Below are the non-venomous snakes we came across along with one that we didn’t, but you may very well. This snake and the next one on the list were the most prolific. They seemed to be always moving. Where some of the bigger snakes would just lay there, look at you and not move, the garter wanted to get away, fast. They come in many color schemes from dull to vibrant. The most interesting encounter with this snake species happened when we were hiking with a friend. She screeched and came to an abrupt halt. I pulled up beside her and she pointed a few feet in front of her and down. There was a garter snake, head raised about 8 inches off the ground heading right toward us. I knew the snake was harmless but the way it was moving with its head high, and towards us, was menacing. As it got closer we could see it had something in its mouth. The grasshopper looked like it could get away and, people present or not, that snake was not going to let that happen. 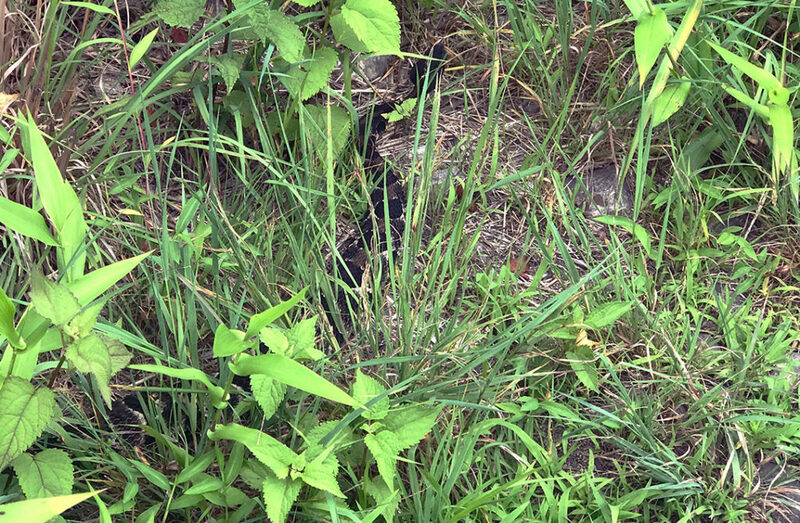 If you thru-hike the Appalachian Trail it is highly likely you will come across a black rat snake.Growing as long as seven feet this black beauty is difficult to miss. As their name implies the snake is fond of rodents. It makes sense then that they are sometimes found around AT shelters. They perform a great service and are harmless, so don’t go getting all Indiana Jones on them. The hognose snake was by far the most memorable snake we came across on the trail. Like many of the snakes we saw this guy was laying right across the trail catching some rays. For non-venomous snakes that were laying in the trail, we tried to go around them. If there was brush or a drop off or some other obstacle that prevent us from doing that I would touch snake’s tail with my trekking pole and they would nonchalantly slither away. Not the hognose! It acted offended when I touched its tail, as if I had grabbed it, swung it around my head a couple of times and then set it down. It was pissed. It coiled, hissed loudly, and then inflated its neck so that it looked like a cobra. Then the rest of the body grew as well as it puffed up the main body to look bigger. It seems this is a common drama played out by hognose when it is threatened. If all this didn’t work, it might have tried a bluff strike whereby the snake strikes with a closed mouth (bites from hognose snakes are very rare). If there was still a threat, then the last line of defense would be to play dead. It would flop over on its back and stick out its tongue to its darnedest to look pathetic and unappetizing. For this one though, after the puffing up it eventually moved on into the brush. What a cool experience. The first snake we saw on the trail was in North Carolina and was a milk snake. Although the milk snake has the coloring and somewhat the same pattern as a copperhead the diminutive head is a sign that it is harmless. We ended up seeing two other milk snakes along the way and none of them ever seemed to be in a hurry nor were they bothered by our presence. Another snake that is relatively common (but we didn’t see one) is the brown water snake. The photo below was taken by our friends who are thru-hiking this year. This was snapped at the river that runs through the Nantahala Outdoor Center (NOC). A small grass snake with a bright yellow ring around its neck, these are common along the trail (we only saw one though). The last two I don’t know what they are. If you know let me know in the comments and I will add the info to the blog post. The black one I just love its pattern. These have since been identified. The first is a red-bellied snake and the second is another garter snake. 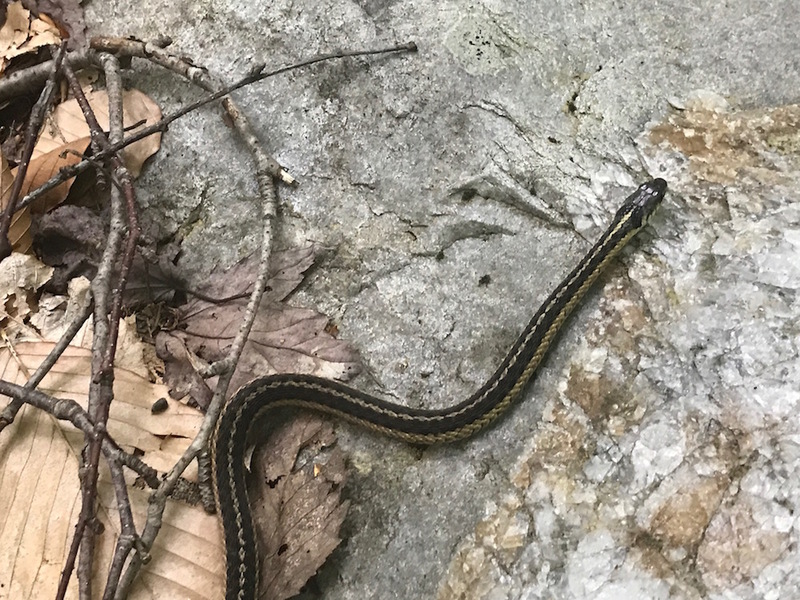 Thanks for joining us on a tour of the snakes we saw on our thru-hike of the AT. I would love to hear your story of snake encounters on the Appalachian Trail. If you have one, comment below. Nice article, Greg. Just curious: Did you gain your snake knowledge before starting on the AT or as you went? The answer is both. I had an interest in herpetology growing up, but found out a lot about individual snake species while on the trail. Awesome post. Thanks so much. I’m going to spend some time with this post because I really want to be prepared. I don’t necessarily have an interest in herpetology, I just want to be ready if I encounter a snake. A little knowledge can quell fears. Snakes are benign creature unless messed with. Most hikers don’t see as many, I like them so was very observant. Most of them Jen walked right by without seeing. Also, there are very few bites on the AT (or anywhere). 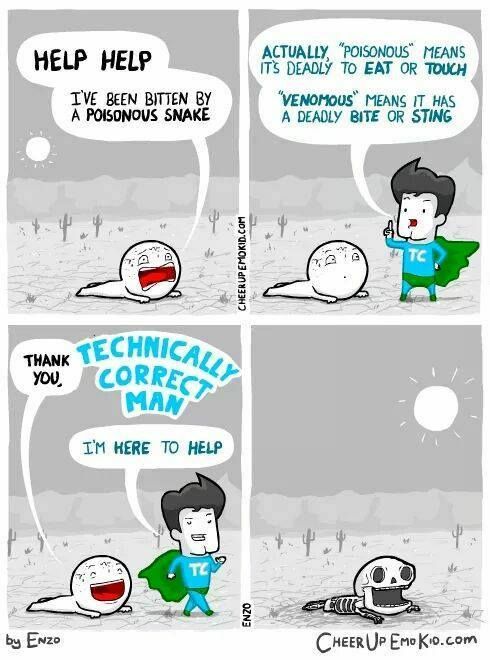 It’s better to worry about ticks than snakes, they are more dangerous. 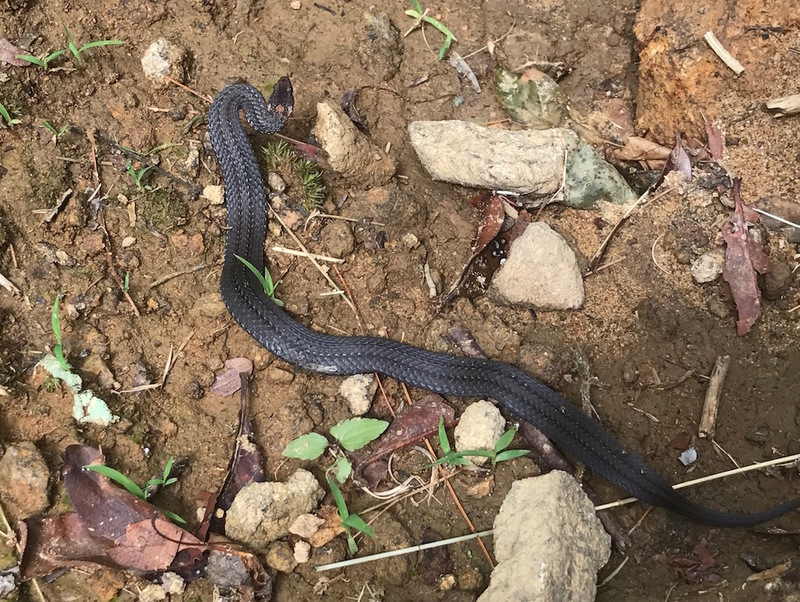 I’ve hiked several sections of the AT between Duncannon and Michaux State Forest several times (Harrisburg/Carlisle) and I’ve seen 1 black racer in that time. I’ve probably walked by dozen I didn’t see. Where loose fitting long pants and closed toe boots just for general safety, but nothing to fear. The humans are probably more dangerous. Phenomenal write-up. I hope it is okay that I shared it on Facebook. I love snakes and always enjoy seeing them. We have mostly run across kingsnakes, garter snakes, and timber rattlers on our hikes on the AT in GA and along various trails in the Smokies. We have never had a negative encounter. The unidentified snake photo I believe is a Black Racer. As for the unidentified video, I think it is just a colored variation of the Garter snake? Thanks Brad. Of course you can share, there are also share buttons on the post itself to help facilitate. Yes, I think you are right on both counts of the last two snakes. Thanks! The first is a red bellied snake (Storeria occipitomaculata). The second is a garter (Thamnophis sirtalis). I thru’d in 2015 SOBO. Thanks for the ID Terrapin. This is hugely usefu – thank you for the thorough write-up.